After doing a little bit of long distance cycling, I have determined that two of the route planning challenges to a cyclist are getting through large cities, and crossing rivers. Cities can pretty much be be avoided by generally going and staying out of town and travelling in the country and small towns whenever possible. Rivers don’t help out much in this regard; it is not possible to go around a river. On my 2013 trip to Memphis, I found a reasonable bridge for crossing the Mississippi River at Memphis. 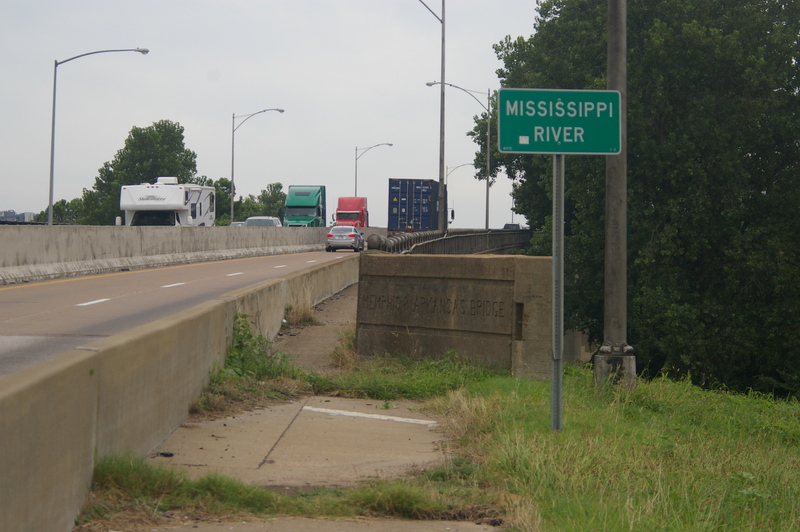 The Memphis area has two bridges that cross the Mississippi – the I-40 bridge that connects to the downtown area, and the I-55 bridge that directs you either South to Mississippi or West to Arkansas. The I-40 bridge is not for cycling; it is a high speed interstate bridge with a lot of traffic and no shoulders, and no safe area for pedestrians or cyclists. Stay away from that bridge or you will most certainly die attempting to cross it. “Yea verily” and all that. 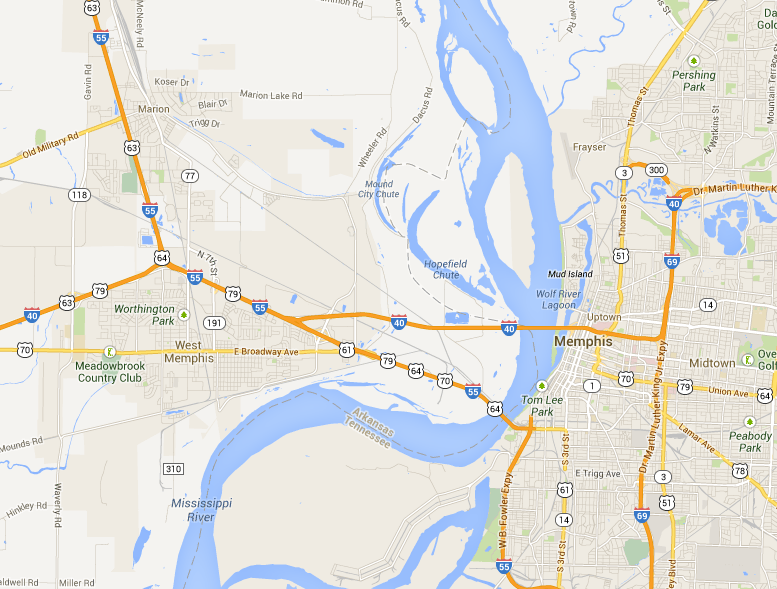 The Memphis area has 2 vehicle bridges across the Mississippi River. The I-55 bridge is reasonable for use by bicycles and pedestrians, but getting there is the challenge. The official name for the I-55 bridge is the Memphis & Arkansas Bridge (opened 1949), and is actually one of three bridges side by side. The other two bridges are the Frisco Bridge (1892) and the Harahan Bridge (1916). The Frisco Bridge is rail only and is operated by BNSF and the Harahan Bridge is run by Union Pacific. The Harahan Bridge used to have cantilevered roadway on the North and South sides, and in fact was the highway crossing before the Memphis & Arkansas Bridge was built. Although the support structure for the roadway is still there, the roadway surface has been removed, and it is not usable by vehicles, bicycles or pedestrians. There is a Harahan Bridge Project in the works to revert the North side of the Harahan bridge back for use by pedestrians and cyclists, but the target seems to be about 10 years, starting in 2014. For now, this bridge is not useful to cyclists. Looking East at the remains of the old East-bound roadway on the Harahan bridge. Clearly, it is no longer usable. 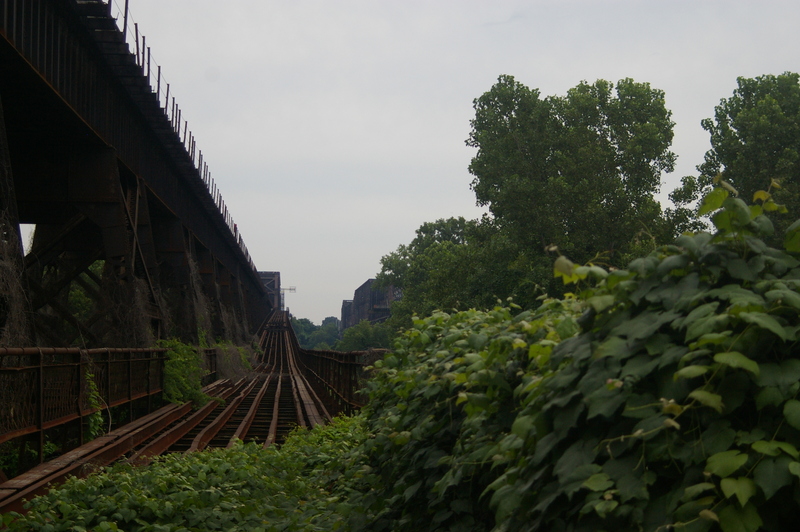 The Frisco Bridge can be seen through the weeds to the right. Coming from the West, find highway 70 through West Memphis. At some point, this becomes Broadway Avenue. 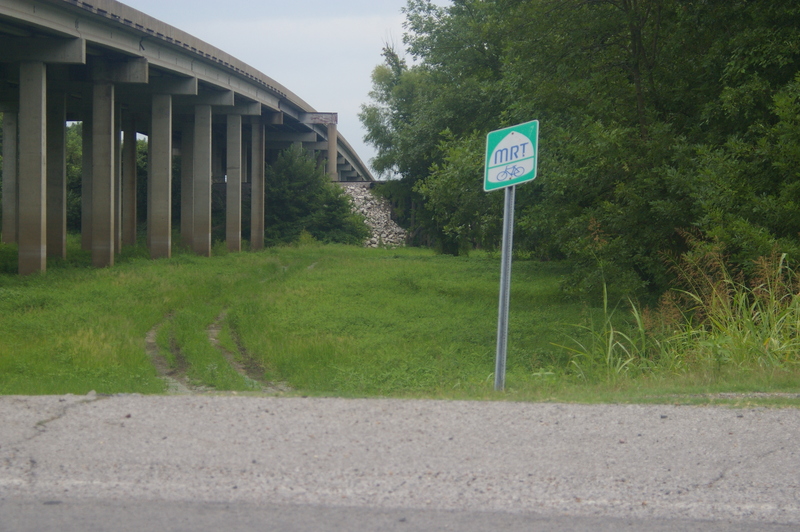 There are signs along Broadway indicating that this is part of the Mississippi River Trail (“MRT”), although the signage and apparent route are not completely helpful. Take Broadway as far as it goes East, until it loops under I-55. Just before Broadway loops underneath the freeway, there is an MRT sign pointing off into the grass, towards a railway bridge. If you want to take the official MRT route (and slosh through the mud, water and mosquitos), then take this route. You’re on your own. It didn’t work for me. 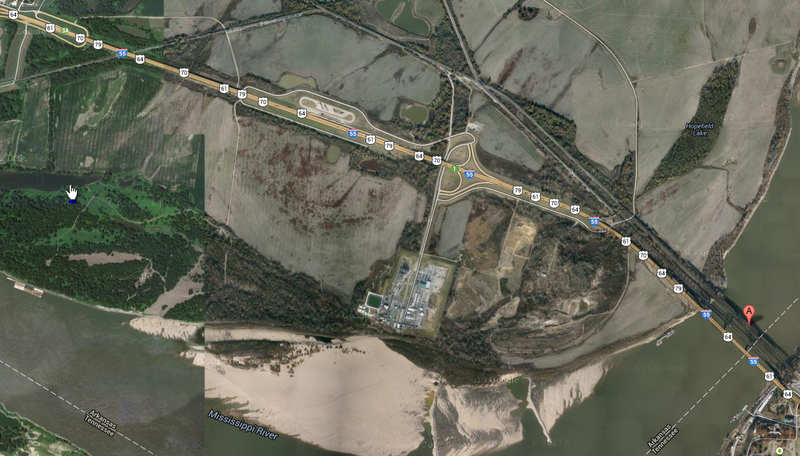 The paved access road runs along both the North and South sides of I-55. 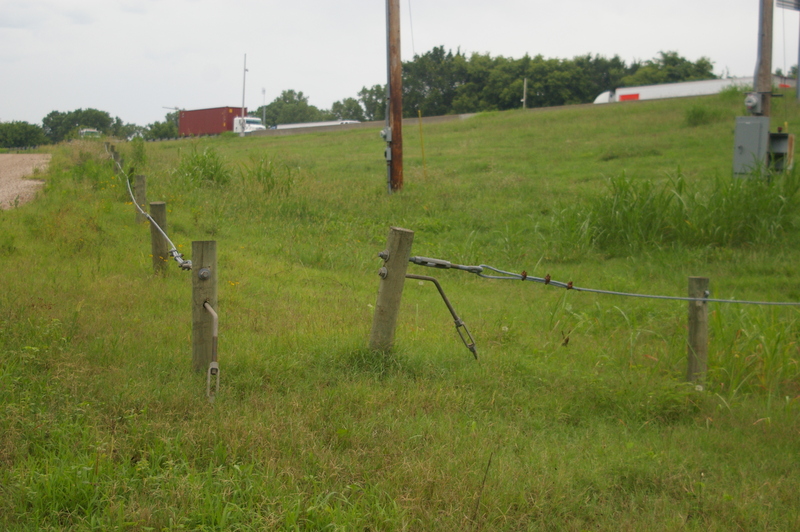 You want to turn left and ride on the North side of I-55, past the truck weigh station. The road curves a bit North, goes through some trees and curves back under I-55 towards a BASF plant. After passing under I-55, there are 3 roads to the left. The first is the East bound exit off the freeway (ie. traffic coming towards you). 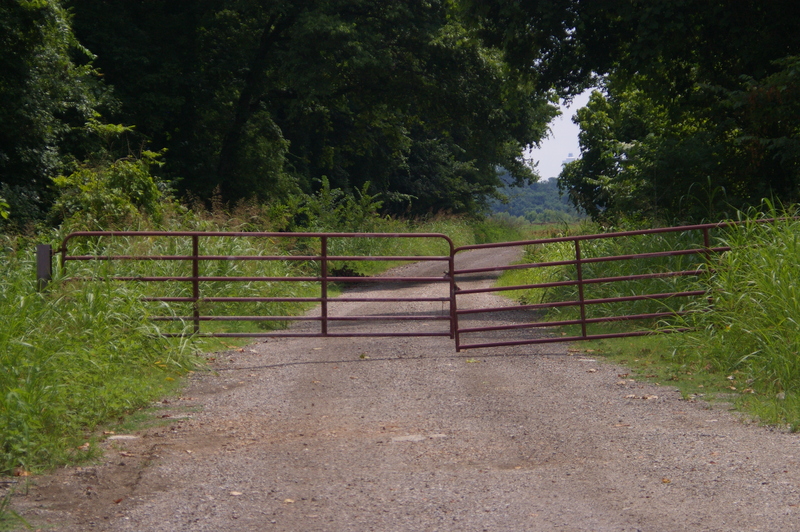 The second is the entrance to the freeway. The third is access road that will take you about a half mile East and go under I-55. At this third road, there is an MRT sign that incorrectly tells you to go into the BASF plant. Don’t go on the BASF property; they are not hostile but unfriendly and unhelpful. Right at the incorrect MRT sign, turn East onto the access road. Just before the curve under the bridge, there is a break in the fence. Dismount your bike and push it up the embankment to the edge of the bridge. The break in the fence. Dismount, push your bike through here and up the embankment to the walkway on the bridge. The first few feet of the bridge are a bit narrow, with some weeds and debris right at the entrance. You will need to push your bike through this gap. Looking East from the Arkansas end of the bridge’s South side. Once you are on the bridge, the walkway widens out a little and you can ride the rest of the way across. I came here by car the previous week before my ride to plan and survey the route. I anticipated then that I might have to walk the bike all the way across the bridge, but I had no problem riding. The bridge has a 3 foot railing on the right and fence with structural sections that interrupt the walkway about every 20 feet or so on the left. You may or may not have a different experience. 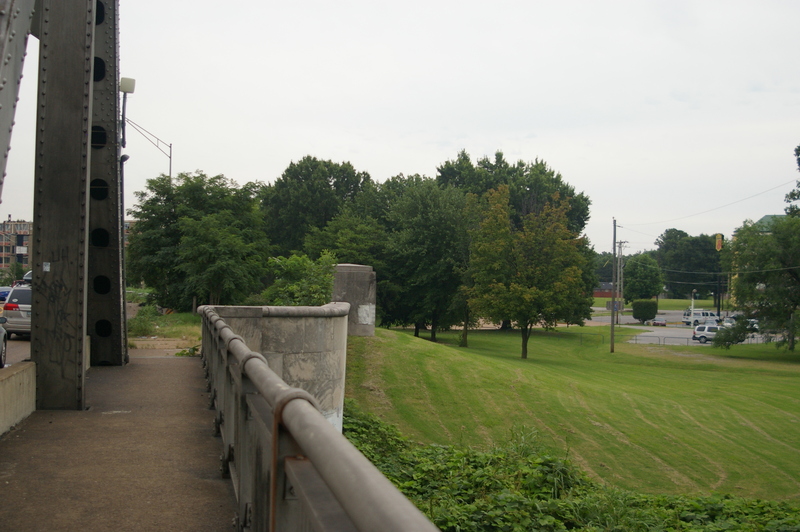 The East end of the bridge comes out at E.H.Crump Park in Memphis, next to a Motel 6. When planning my trip, I allocated a lot of “nuisance time” for route finding and crossing the bridge, and put my “end of day” at this hotel. The hotel was in a good location and I ended up staying here, but the river crossing was easier than I anticipated, and I could have gone on further. Looking East on the Memphis side. The Grassy area to the right is E.H.Crump Park. So, there you are. Robert is your mother’s brother. Or “Bob’s your uncle” if you like. Crossing the river by this bridge is not difficult. The challenge is finding the West end of the bridge when coming from the West. Hopefully you find this page helpful. THANK YOU! Now we can get across into Memphis. I owe you several beers because without your time & trouble in writing and posting this info, there isn’t a cat in hell’s chance that I could have crossed the Big River legally yesterday.